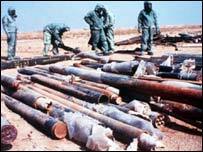 Was the evidence over Iraqi WMDs manipulated? Lawyers for peace campaigners CND are arguing the failure to find weapons of mass destruction in Iraq has made the legality of the war questionable. The group is pressing for a judicial review into the attorney general's advice to the government that attacking Iraq was legal. Before the war, Lord Goldsmith said that despite the absence of a second United Nations resolution, an attack was covered by existing international law. His reasoning was based on the existence of weapons of mass destruction (WMD) in Iraq which were a clear threat to the UK. The issue has plunged into renewed controversy amid claims that Iraq's WMD threat had been "sexed up" by Downing Street with undue prominence given to a dubious claim an attack could be launched in 45 minutes. The Foreign Affairs Select Committee is due to look at the issue and has invited both Tony Blair and his director of communications, Alastair Campbell, to give evidence - although it is thought unlikely either men will accept. The prime minister is due to appear before Parliament's intelligence and security committee on Tuesday, although Downing Street said he would not be giving evidence on WMD. However senior backbenchers may well get a chance to quiz Mr Blair on the issue when he appears before the liaison committee in July. On Monday, CND barrister Philip Shiner told BBC Radio 4's Today programme: "It's apparent more than three months later that there are no WMD or if they exist it's in nothing like the quantities that suggest that the threat was so clear." He said many international lawyers said at the time that a second UN resolution was required but the UK relied "on a resolution over 12 years old at the time of the start of the 1990 war that permitted proportionate force to disarm Iraq to be used". CND wants the evidence the attorney general based his judgements on to be examined. "Did the government accidentally or deliberately exaggerate the threat to mislead the public?" asked Mr Shiner. The Conservatives have repeatedly called for an independent inquiry into whether intelligence documents were changed on the orders of Downing Street to strengthen the case for military action. A second dossier published in February was widely criticised when it emerged part of it was copied from a 12-year-old thesis by an American student. A first document to make the case for war, published last September, is already being investigated by MPs. Mr Shiner is writing to Tony Blair and Defence Secretary Geoff Hoon to call for a judicial inquiry. If they reject the call, as the government already has, Mr Shiner said CND would take legal action "to force them to do it". Lord Goodhart, the Liberal Democrat peer who initiated a Lords debate on the legality of the war in March, said he did not think calls for a judicial review would succeed. "The action is a blind alley," he said. "I think the attorney general's opinion was wrong but he had to look at the facts as they were put before him." "We'll be pushing for an independent judicial review"